After a woman has her eggs retrieved, there are typically two options when it comes to the timing of a transfer. The first is a “fresh” transfer, whereby the best embryo(s) are transferred into the uterus only three to five days after the retrieval. Any remaining embryos are frozen for a future transfer, if needed. Alternatively, all the embryos could be frozen immediately, including the best embryos, to be thawed for a transfer at a later date. 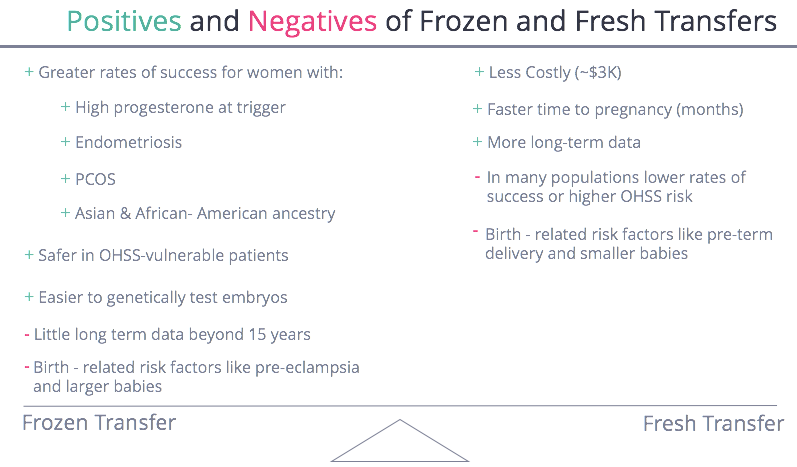 In many cases it will be clear before the cycle even starts that some women will need to do a frozen transfer (for example women who have PCOS or those who want to do PGS testing). But in other cases that will only be revealed right before the retrieval (like when a women has high progesterone at the time of retrieval). Below we summarizes the trade-offs for both approaches. As you may recall from other lessons and chapters, nearly all IVF cycles involve stimulating the ovaries to retrieve a high number of eggs. A result of creating so many eggs is that estrogen and progesterone levels can rise 10 times higher than their normal peak levels. The uterus takes note of such a rise and hurries to prepare itself to receive an embryo. Therein lies a problem. That’s because the uterus is only “receptive” to an embryo implanting for a short time, and when it rushes to prepare itself in reaction to the hormonal surge, this “window of receptivity” can be moved earlier. As a result, in a fresh cycle, by the time an embryo is mature and ready for transfer, the uterus is less likely to be “receptive” and the odds the embryo implants are lower. Conversely, in a frozen cycle, the doctors wait for a woman’s hormonal balance to restore and can transfer the embryo on a later date, at a moment when her uterus is most receptive. When a woman’s ovaries are stimulated, those who have high progesterone levels (for example 1.5 ng / mL) at the time of the trigger shot are more likely to have the window of receptivity shift and, as you can see below, are less likely to succeed in a fresh transfer. In these cases, many women will want to opt for a frozen transfer. For those hoping for a fresh transfer, this news can be a let down because it comes only days before they expected to transfer. Ovarian stimulation also causes estrogen to rise which can be problematic for women with endometriosis, as endometriosis tends to feed off of estrogen. There are a handful of studies showing that women with endometriosis often tend to do better with frozen transfers than fresh transfers, because fresh transfers occur on the heels of stimulation, when estrogen levels are elevated. Additionally, women of South Asian, East Asian, and African-American heritage have worse outcomes compared with Caucasian women during fresh transfers. 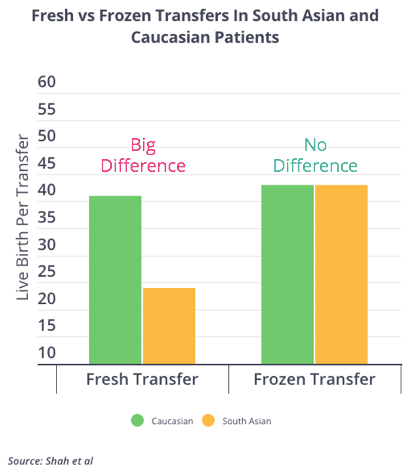 Below is data from a small study at Stanford on women of South Asian descent (UCSF has published similar data for East Asian women) that shows a major step down in success rates after fresh transfers, but not after frozen transfers. Most experts theorize these groups produce higher levels of estrogen and progesterone during stimulation and as a result their window of receptivity is more likely to move, making fresh transfers less likely to work. 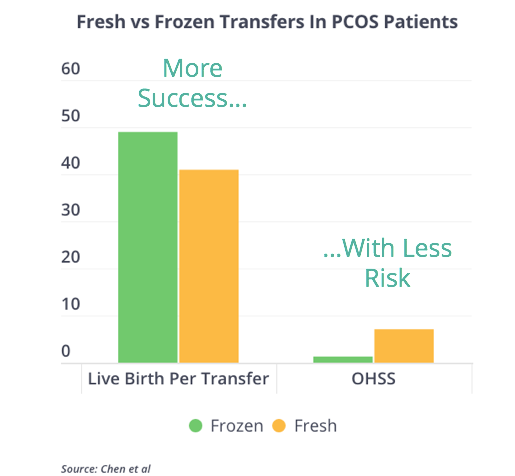 It appears that women who have PCOS, or possibly other OHSS (ovarian hyperstimulation syndrome) risk factors, are better suited to having a frozen transfer rather than fresh transfer. Specifically, for women with PCOS, one better regarded study (relying on cleavage stage embryos, unfortunately) in the New England Journal of Medicine noted women with PCOS had higher live birth rates, and lower incidence of OHSS, when they underwent a frozen transfer. For women who are at risk for OHSS (like those with elevated results on the AMH blood test, high AFCs on ultrasound, or who produced a high number of eggs in a previous cycle), fresh transfers exacerbate the risks, because the pregnancy itself at that point can lead to OHSS. Finally, for patients who want to genetically test their embryos, the logistics are far easier if those embryos are frozen and transferred on a later date, allowing time for the testing to be done (often at a separate facility from the clinic). 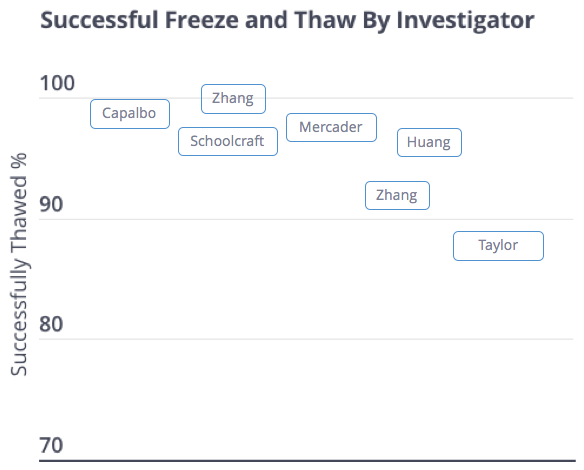 In this case, it’s easy to foresee that these patients will likely be doing a frozen transfer. There are a lot of doctors who still prefer to do a fresh transfer with a patient’s best embryos. For one, we have longer-term data on how offspring develop from fresh embryos. However, both fresh and frozen embryo transfers are now over 3 decades old and the data is reassuring. All the same, the methods of freezing (vitrification instead of slow freeze) have been updated in the last fifteen years and so we have less long-term data on the more modern vitrification approach. 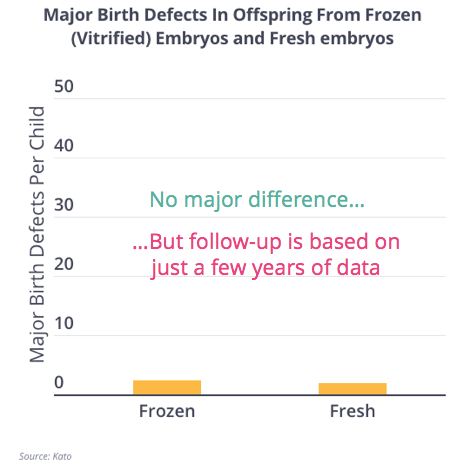 Below is data on over 6,000 babies born from either vitrified frozen embryos or embryos that were transferred without freezing: the data is reassuring but does not provide us truly long-term follow-up. 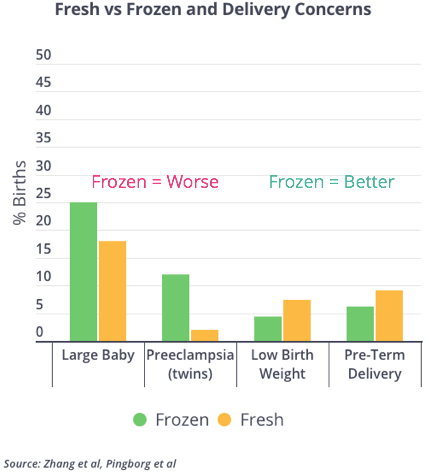 Next, many doctors worry about data showing babies born from frozen embryos are large-for-gestational age and that pregnancies with these embryos correlate with preeclampsia in the mother. 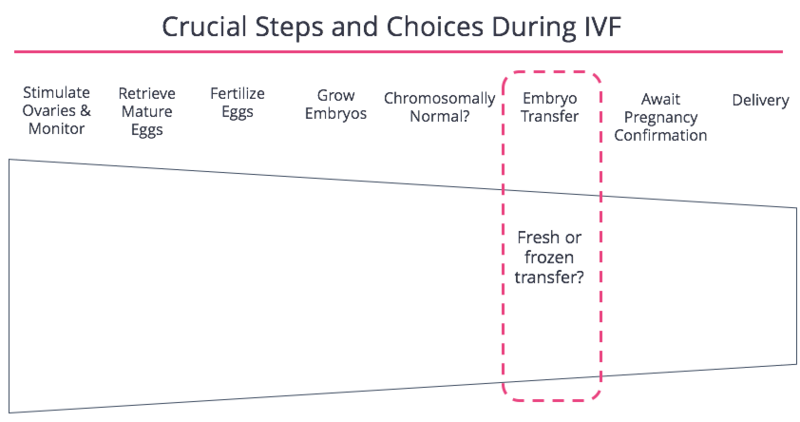 However, as you can see from two separate studies below, fresh embryo transfers have issues in their own right. They correlate with delivery-related risks, namely having a baby that’s underweight or delivered prematurely. Generally speaking, most doctors tend to worry more about the risks associated with fresh transfers. A major concern patients have is that their embryos will be damaged in the freeze-thaw process. As you can see below, often the better clinics in the US report that 95 - 99% of the embryos they freeze will thaw in-tact. More run-of-the-mill clinics likely have rates closer to 90 - 95%. How comforting those numbers are may depend upon how many embryos a patient creates. For patients who produce only one good embryo, a 1-in-10 chance of losing that embryo and not making it to transfer may feel unacceptable. Unless this patient could clearly benefit from a frozen embryo transfer (for example if they have PCOS), opting for a fresh embryo transfer may be best. An additional consideration for patients is that fresh embryo transfers are often cheaper than frozen embryo transfers. All told, between the additional costs to freeze and thaw an embryo, plus the additional monitoring costs for the frozen transfer cycle, the difference can amount to a few thousand dollars. However, one needs to put this in the context of what it costs to create those embryos in the first place, as one IVF cycle typically costs around $20,000. Most patients make three or fewer embryos, so each embryo and transfer is crucial. For patients who clearly enjoy higher success rates with a frozen embryo transfer (often times a third higher! ), the cost trade-off of doing a frozen embryo transfer can likely be justified. Finally, patients are often eager to have a fresh embryo transfer because it will help them get pregnant faster. However, the delay of a frozen embryo transfer is often only a month or two. For many patients, especially those who have come from overseas, that wait can feel interminable. But this should be kept in the context of how long most patients must undergo IVF before they conceive. Most patients must undergo 2 - 3 cycles, often over the course of 6 - 12 months. Put in that context, and a month long delay may seem more palatable.